I was invited on a press trip to Soave just a few weeks ago, one of six invitations I received for events in Italy during the same time frame! (Don't these people ever talk to each other?). I had already committed to another event in Piemonte and just wasn't able to work this Soave trip into my schedule, which was a shame as Soave is one of my favorite Italian wines and I've come to know several producers there quite well and was looking forward to seeing them again. It's also a lovely area, just 30 minutes east of Verona in the Veneto region and it's castle is one of the most distinctive and beautiful in all of Italy. Anyway, I asked the Soave Consorzio if they could ship a few bottles of wine to my hotel in Piemonte at that time - if I couldn't make it to Soave, maybe Soave could make it to me! I thought they might send a half-dozen bottles, but they outdid theselves and sent along 21! Needless to say, I had a lot of friends during my stay in Piemonte! While Soave has always been a known commodity to consumers in America - thanks in part to its easy to remember and easily pronounceable name - the wine has rarely been thought of as something truly special. It is true that the majority of Soave produced in the zone is meant for consumption within the first 2-3 years and unfortunately that doesn't mean much in our society, which rewards big and powerful wines the can age for 5-7 years and longer (despite the fact that many consumers prefer to drink wine in its youth anyway!). To miss out on Soave normale would be a shame, especially the bottlings from producers such as Pieropan, Castello di Soave and Pra. These are made primarily from the Garganega grape, with up to 20 or 30% Trebbiano in the blend. The best regular bottlings of Soave are a delight, with aromas of honeydew melon and yellow flowers, with a subtle nuttniess. Crisp, well-balanced and usually made without any oak aging, these are wonderful partners for foods ranging from risotto primavera to lighter seafood. While these wines are a delight and also priced very reasonably ($14-$16 on American retail shelves), there are some excellent single vineyard or selezione bottlings that truly are among Italy's finest whites wines. There are a few dozen producers in the area, such as Ca'Rugate; Coffele; Inama; Monte Tondo; La Capuccina and Gini as well as the others mentioned above, to name only a few, that have been working to expand the breadth and width of Soave's possibilities. These special bottlings display more complex aromatics, are richer on the palate with excellent persistence and offer distinct minerality in the finish, a quality witnessed in Italy's most famous white wines, from Friuli in the north to Campania in the south. Some of these wines are even aged and/or fermented in oak, which may come as a surprise. I certainly am not a big fan of oak in white wines, but when you taste a deeply concentrated Soave such as "Monte Alto" from Ca'Rugate, "La Rocca" from Pieropan or "Foscarin Slavinus" from Monte Tondo, you realize how far-ranging Soave can be in its presentation. These wines are beautifully styled with amazing complexity, while staying true to the character of the Garganega grape and the local terroir. And yes, these wines can age - anywhere from 5-10 years. So think of Soave not just as a simple quaffer for lighter meals, but as one of Italy's most singular and rewarding white wines! Best of all, think of it as one of the best wines to pair with a wide variety of foods, as some of the finest examples can even stand up to veal, roast pork and lighter game. Made using grapes grown according to strict biodynamic methods, this is very rich with a distinct minerality and a lengthy finish with excellent persistence. This seems perfectly styled for grilled shellfish. Here is a wine that could change your perception of Soave! This wine just bursts with fruit - Anjou pear and pineapple - and is quite rich throughout. Beautiful ripeness and aromatics, this is a real pleasure on its own or with food. Gini should be on everyone's short list of great Soave producers; this "regular" bottling is quintessential Soave with its pear and honeydew melon aromas along with notes of yellow flowers and chamomile. Medium-full with a rich finish with mineral notes, this is beautifully made and delicious! This is a selezione made from grapes grown in volcanic soil. Classic Soave aromatics, very good persistence and acidity and pleasing notes of chamomile. Very well made. Bright yellow with golden tints, sporting pear, melon and lilac aromas, this is ripe, nutty and quite complex with excellent fruit concentration. This is another stylized bottling that is far removed from the simple sipping wine too often associated with Soave. The wines from this producer are always interesting and very well made. They are also routinely excellent. Great Champagne - in Piemonte! No matter which wine region in whatever country you visit, you'll find that winemakers need to try something besides their own wines from time to time. Sometimes, it's beer (especially on a hot day), at times it's another product from a local estate and then there are days when the choice is something totally different from what they produce. In Italy, winemakers - as well as most wine drinkers there - adore sparkling wines. Look at how many sparkling wines are produced throughout the country; not just Franciacorta and Prosecco, but cuvées made from varieties such as Falanghina in Campania, Verdicchio in Marche and Ribolla Gialla in Friuli. It's quite a love affair Italians have with sparkling wine! That extends, of course, to Champagne and it was with great anticipation that I joined my winemaker friends Sergio Germano (Ettore Germano) and David Rosso (Giovanni Rosso) from Serralunga d'Alba at a wonderful enoteca in that town called Vinoteca Centro Storico, home to one of the most varied selections of Champagne I've found anywhere outside of that famous zone. The owner, Alessio, is a charming young man who loves finding excellent Champagne from some of the finest artisan producers from Champagne and he's been rewarded for his efforts by the area's vignerons. I've met Sergio and Davide before at the enoteca and was anxious to see what we would be enjoying this particular evening. For starters, we enjoyed the Doyard Extra Brut, a very dry Champagne with only a slight dosage. The wine was an excellent start with a pronounced yeastiness and aromas of dried flowers. It was a great partner with the various salumi offered at the bar. 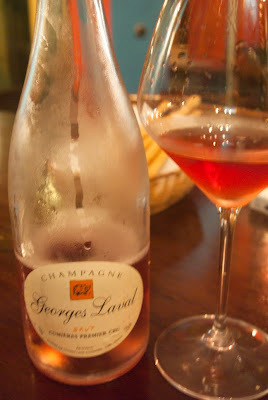 We then ordered a Georges Laval Brut Rosé, made in the saignée style, where the color is bled from the skins of the Pinot Noir grape. Bursting with ripe strawberry and cherry fruit, this was a delight! How nice that Alessio provides choices such as this, allowing the customer to experience a rainbow of flavors from Champagne in the heart of the Barolo zone! A few days later, Sergio and I enjoyed a tremendous lunch at Antica Podere Tota Virginia, located in Serralunga with magnificent views of the entire Barolo zone. We enjoyed some amazing seafood (not the usual fare in Piemonte) from Chef Claudio Cagliero and with it, paired the non-vintage Larmandier-Bernier Blanc de Blancs Premier Cru (pictured at top of the page), a wine Sergio recommended for the quality/price relationship (the cost was a reasonable 45 Euro on the list). Quite rich with flavors of dried pear, the wine has a distinct minerality and excellent persistence with beautiful complexity. The wine made for a stunning pairing with our seafood (I had a plate of octopus, shrimp and swordfish that was incredible) and I'd order it again, especially at the price. I admit that the prospect of trying more than 300 wines from the Nebbiolo grape that upcoming week made me long for sparkling wine (or just about any dry white). But these Champagnes were more than just alternative choices - they were excellent selections in their own right and reminders of how good the quality level is in the Champagne district. Just back from tasting more than 180 bottlings of the soon-to-be-released 2006 Barolo. Here are a few initial thoughts. The wines from 2006 are big, make no mistake about it. If you are a relative newcomer to Barolo, this may not be the vintage for you, unless you have a lot of patience. These are wines that demand time and are in some cases, rather old-fashioned, as they are not approachable now, but rather are tightly woven and unyielding. If you prefer prettier, more forward wines, wait another year for the release of the 2007 Barolos. The wines are also inconsistent. While I tasted some very nice wines (and a few excellent examples) from the communes of La Morra and Barolo, the wines from these zones were not that impressive. Perhaps it was warm weather that yielded wines of big structure that did it, as the wines from La Morra and Barolo tend to be more feminine than other bottlings. 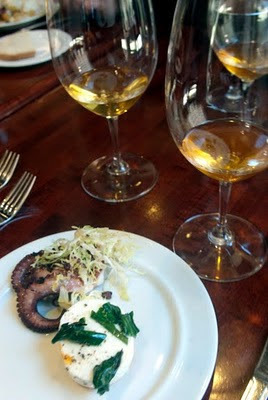 Whatever the reason, many of these wines are a little clumsy - though admittedly, we are dealing with very young wines. The vintage belonged to the wines from Castiglione Falletto, Monforte d'Alba and of course, Serralunga d'Alba. I say of course, as the Serralunga Barolos are always the bottlngs that need the most time, given both their tannic structure (thanks to the oldest soils in the zone) and their deep concentration. 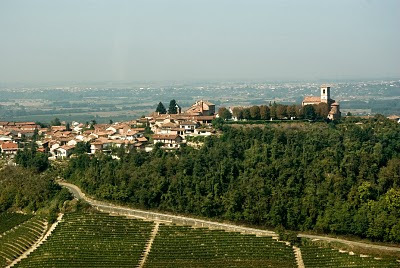 The best Barolos from 2006, such as those from Cordero di Montezemolo "Enrico VI" (Castiglione Falletto), Elio Grasso "Gavarini Chinera" and "Ginestra Casa Maté" (both Monforte d'Alba) and Cascina Cucco "Cerrati Vigna Cucco", Ettore Germano "Prapo" and Azelia "San Rocco" (all from Serralunga) have the stuffing to cellar well for 20-plus years. Cascina Cucco "Cerrati Vigna Cucco"
Ascheri "Sorano Coste & Bricco"
Elio Grasso "Ginestra Casa Maté"
Costa di Bussia "Tenuta Arnulfo"
Cordero di Montezemolo "Enrico VI"
Rocche Costamagna "Rocche dell'Annunziata - Bricco Francesco"
For those of you wondering why I have listed more wines from La Morra than Castiglione Falletto after writing that the latter commune was more consistent, the reason is the game of numbers. 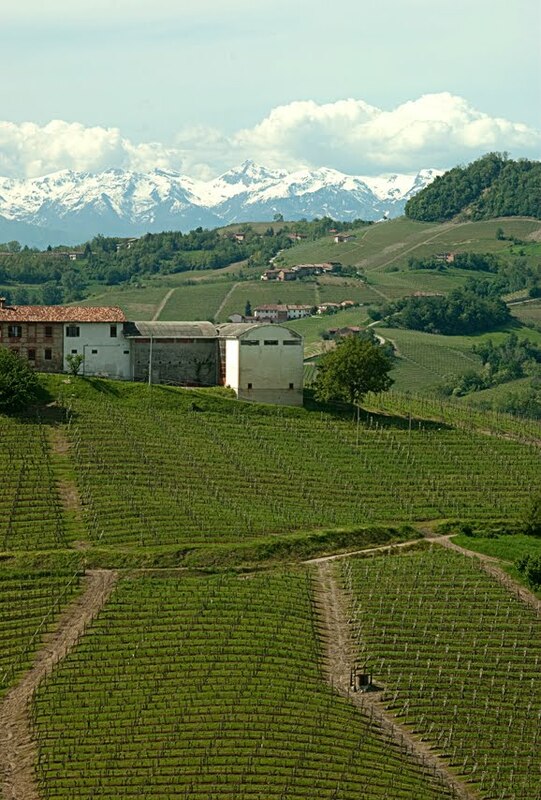 La Morra is the largest commune for production of Barolo, with approximately one-third of the total vineyards for Barolo production; Castiglione Falletto is much smaller. So while I tasted many more examples from La Morra than Castiglione Falletto, I recommended a higher percentage of wines from the latter commune. A few final words: The wines at the Nebbiolo Prima event are tasted blind, so there are always surprises, good and bad. My biggest surprise? The Simone Scaletta wine- to be honest, I'd never even heard of this estate, so bravo to them for producing such a fine 2006 Barolo. No surprise though for many estates whose wines I loved again. There were many, but a special salute to Cascina Cucco and Francesco Rinaldi. 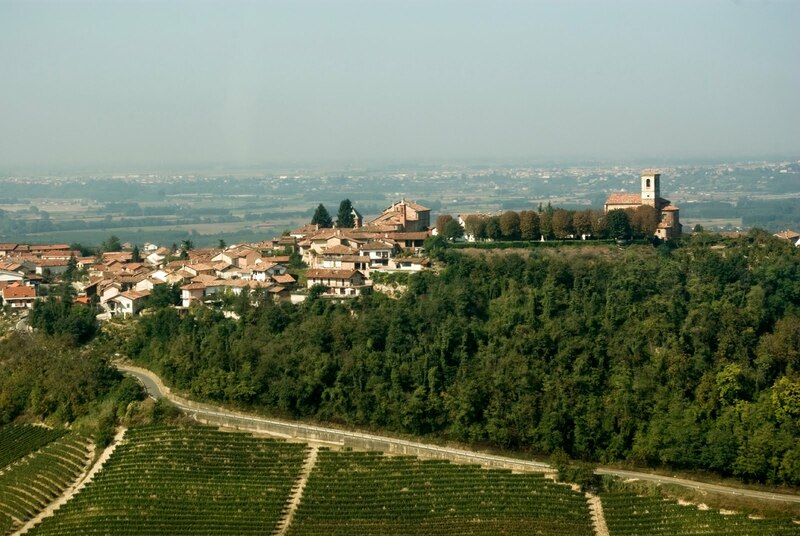 The former is one of the finest estates in a commune (Serralunga) filled with great estates, while the latter quite often gets confused for the wines of Beppe Rinaldi, a great Barolo estate. However, the wines from Francesco Rinaldi are classics almost every year! Finally, if you want to exprience Serralunga Barolo without having to wait ten years, I strongly recommend the Giovanni Rosso "Cerretta" and the two offerings from the "Sorano" vineyard produced by Ascheri. While these wines will age 15-25 years, these three bottlings are more approachable and charming in their youth than most bottlings from Serralunga. The dyed-in-the wool devotées of the Serralunga style may prefer a more tannic wine, but I fell in love with these wines, especially the Rosso bottling, which is as floral and as charming a Serralunga Barolo as you will find! Complimenti, Davide! Writing from Alba, where I am with several dozen wine journalists from around the world for Nebbiolo Prima, four days of tasting new releases of wines made exclusively from Nebbiolo. This year the wines are Roero Rosso 2007, Barbaresco 2007 and Barolo 2006. 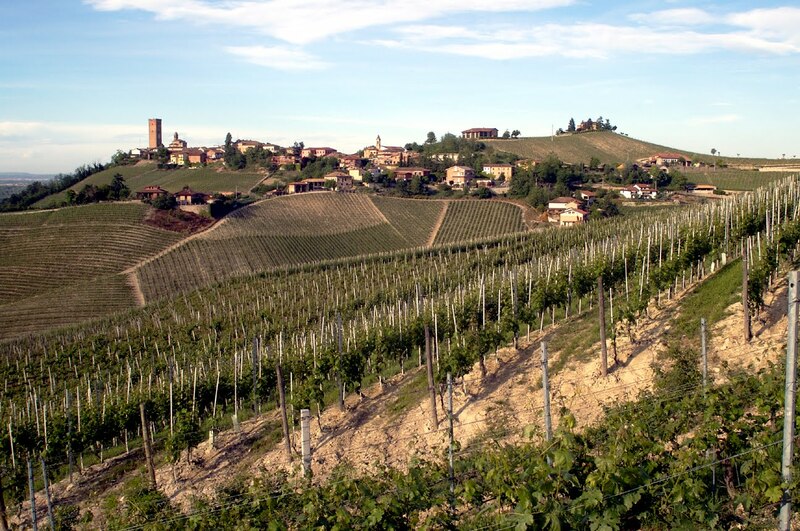 This post will deal with Barbaresco. The 2007 vintage arrives with a great deal of hype and the Barbarescos from this vintage show why. The wines offer excellent ripeness and balance and round tannins. The best wines are quite charming and are rather forward. While all of this is nice, the final result is one of moderate pleasures, as the wines do not have the stuffing (for the most part) to age a substantial period of time. I would expect most of these wines to be at their best in 7-10 years, which is a good, but not great amount of time. While the best wines from the town of Barbaresco and Treiso are beautifully balanced, unfortunately too many examples from Neive are over oaked. This is not the first time I have noticed this trend at this tasting (this is the sixth time in the last seven years I have participated in this event) and again, the winemakers from Neive, in my opinion, are trying to hard to make a bigger, more serious wine than they should. I did find a few bottliongs from Neive that were more restrained in their use of oak, but they were the exception. I would hope this changes in the future. The wines were tasted blind, so as always, there were surprises, good and bad. I also visited the Ceretto estate a few days before these tastings and thoroughly enjoyed their 2007 "Bricco Asili" bottling, which is from the vineyard in the commune of Barbaresco. I am off today for Alba in Piemonte where I will be tasting new releases of Barolo from 2006 and Barbaresco from 2007. This is at an event called Nebbiolo Prima for a select group of wine journalists from around the world that specialize in Italian wines. The tastings are focused on wines made exclusively from Nebbiolo and will also include new examples of Roero Rosso from 2007. I tasted a few bottlings of 2006 Barolo at VinItaly last month as was quite pleased, especialy with the Vietti Brunate and Rocche and the Oddero Rocche di Castiglione and Villero. These are big wines and very true to type; the Brunate from Vietti and the Rocche from Oddero are extremely well balanced. I'm looking forward to trying dozens of these wines and I'll do my best to post while I'm there; if not, then I'll note my thoughts just after I return home. This past Monday at a distributor tasting in Chicago, I saw my friend Steven Alexander, wine director for the city's internationally famous Spiaggia Restaurant. 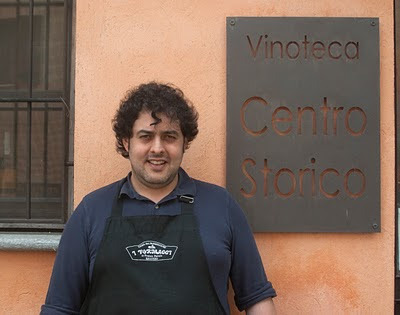 He asked me if I had any specific recommendations of Italian wines I enjoyed at the tasting and then graciously asked me to a special lunch at Spiaggia Café with Giampiero Bea from the Paolo Bea estate in Montefalco, Umbria. Of course, I accepted his invitation and I'll be forever grateful to him as this was a rare opportunity to try ten of Bea's wines with superb food, while listening to Giampiero discuss his winemaking philosophy. In the Montefalco zone of Umbria, not far from the towns of Spoleto and Assisi, there are a few dozen producers that work with the indigenous Sagrantino grape. This is a very tannic variety - arguably the most tannic in all of Italy (even more so than Nebbiolo) - so while this means long-lived wines, many examples are rather rough upon release with a noticeable bitter edge. Some producers even age their wines in barriques, apparently thinking that the spice from the barrels will add more flash to the wine. However, it's been my experience with barrique-aged Sagrantino that too many examples are not that well balanced, as the small barrels actually add tannins. 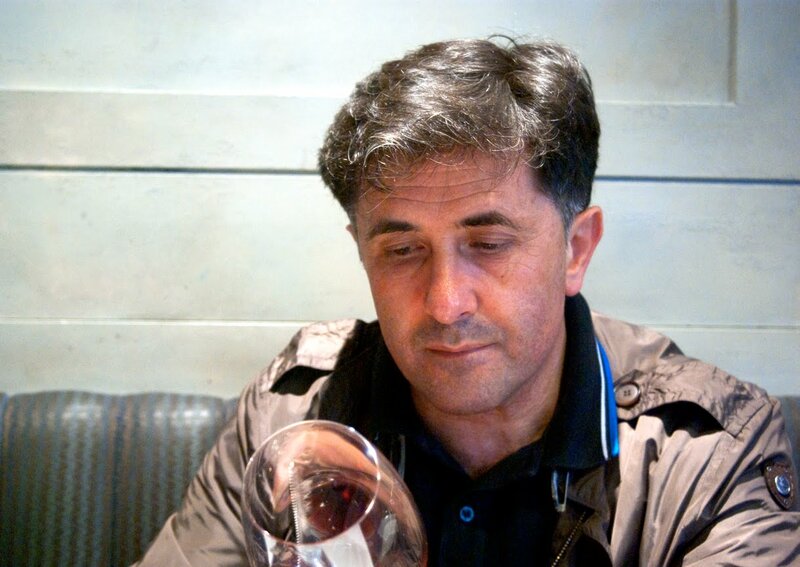 A completely different way of working with Sagrantino is employed by Giampiero Bea who is a believer in making natural wines; the resulting bottlings are sublime. 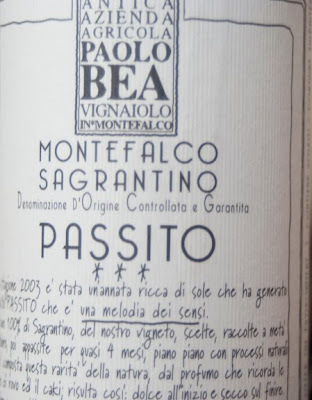 No less an authority than Filippo Antonelli, one of Montefalco's very best producers, recently told me that in his opinion, the finest wines of Montefalco are from the Paolo Bea estate. Even though I have visited the Montefalco wine zone on three separate occasions, I had only tried a handful of these wines, as Bea does not participate in the local Consorzio tastings. 2004 Montefalco Rosso "San Valentino"
2005 Montefalco Rosso Riserva "Vigna Pipparello"
2004 Montefalco Rosso Riserva "Vigna Pipparello"
2005 Montefalco Sagrantino "Vigna Pagliaro"
2004 Montefalco Sagrantino "Vigna Pagliaro"
I'll give some general comments on the wines. The Santa Chiara is an amazing white, an equal blend of five varieties: Chardonnay, Grechetto, Malvasia, Sauvignon and Garganega. Bright orange in color and displaying aromas of apricot and zucchini squash (! 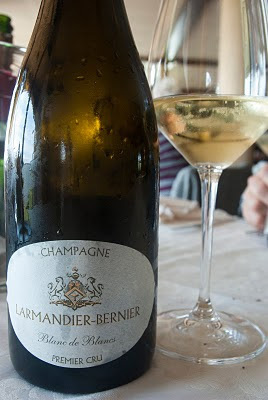 ), this offers distinct minerality with a pleasing bitterness in the finish. The Arboreus is a more traditional white with pear and lemon peel aromas with great complexity. These are superb whites and stood up beautifully to grilled octopus and mozzarella. As good as the whites were, the reds were the true stars of this lunch. 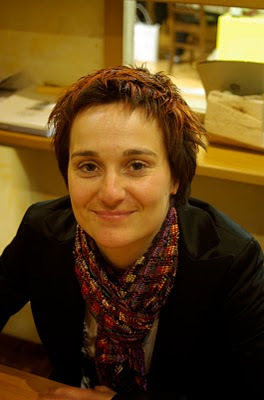 Bea produces both Montefalco Rosso, which is primarily Sangiovese with lesser percentages of Montepulciano and Sagrantino; Montefalco Sagrantino, a DOCG wine made exclusively from Sagrantino as well as Montefalco Passito, also produced exclusively from Sagrantino. Bea's wines are striking in so many ways, especially in the aromatics, which focus on cassis, currant, cherry and red flowers (poppies). The wines have a supple feel on the palate, silky tannins and excellent persistence. The acidity is precise (especially in the 2005s) while the wood notes are barely noticeable. Think of most wines made from Sagrantino and you associate them with power; Bea's wines, on the other hand, are all about finesse. The Passito is truly a singular bottling of this wine; while most examples are lush, ripe and medium sweet, Bea's is much more low-key. The wine has only a trace of sweetness and offers notes of tobacco in the finish. "I call this a vertical wine," he says. "It starts sweet and finishes dry." Because of that, Bea likes to pair the passito not with fruit desserts, but rather with cheeses. It is with the Montefalco Sagrantino dry wines that he prefers biscotti, cakes or chocolate. Bea uses organic methods in the vineyards as makes certain he carries through with this philosophy in the cellar. "We do more work when the moon is waning because things go slower," he says. "This is in keeping with our philosophy of taking our time to make wines that will live for a long time." Bea ages his Sagrantino for one year in steel and two years in large barrels before bottling, so his wines are released later than almost any other producer; the 2005 is his current vintage, while most producers have their 2006s on the market with several 2007s set for release later this year. This is just one reason why he does not participate in the Consorzio events in Montefalco. At tihs lunch, Bea talked a great deal about the technical data of his wines as well as his winemaking philosophy. Yet he did not once mention awards or how certain critics have praised his wines. He is a humble, thoughtful man who lets his wines do the talking - in fact, he does not even call himself a winemaker, preferring to say he is "assisting the wine." Yet he did offer his thoughts on the work of producers from around the world who only make wine for the marketplace and not for themselves. "These people have cellars full of wine. They blame it on the economic crisis, but the truth is they are making wine without emotion." One could never say that about Giampiero Bea.